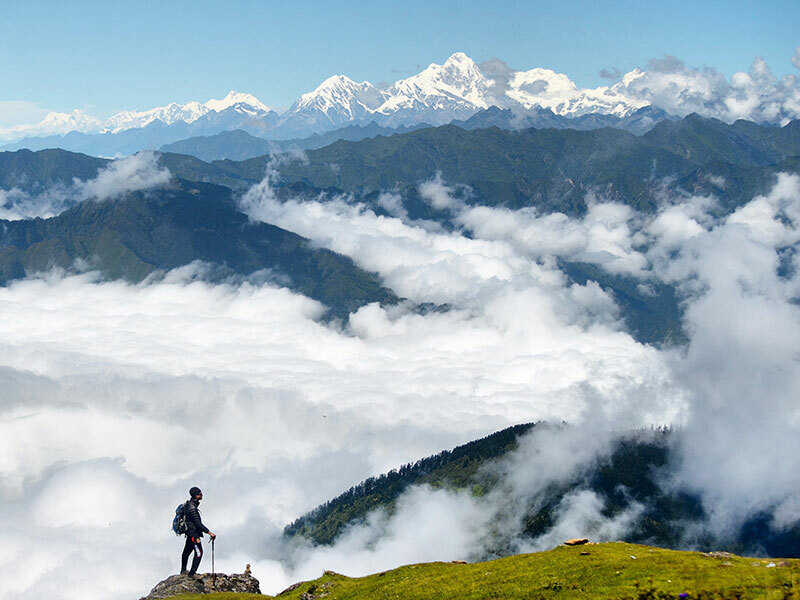 Round Dhaulagiri Trek takes you through various villages and settlement with views of Dhaulagiri I, II, III, IV, and V. Following the glaciers and high passes, this trek is both challenging and strenuous and is recommended for experienced trekkers. Since the trek goes pass snowcapped high passes, it rewards the trekkers with amazing views of Dhaulagiri, Tukuche Peak, Nilgiri, Annapurna, and Machhapuchhre. 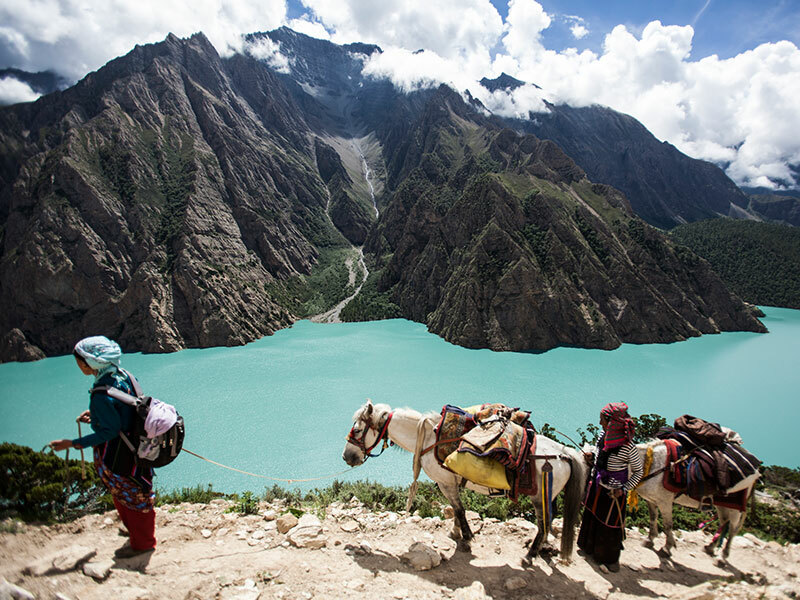 Know for the dramatic contrast, one can notice the deepest gorge of Kali Gandaki River and the landscape with traditional cultures of the local people residing in the area. 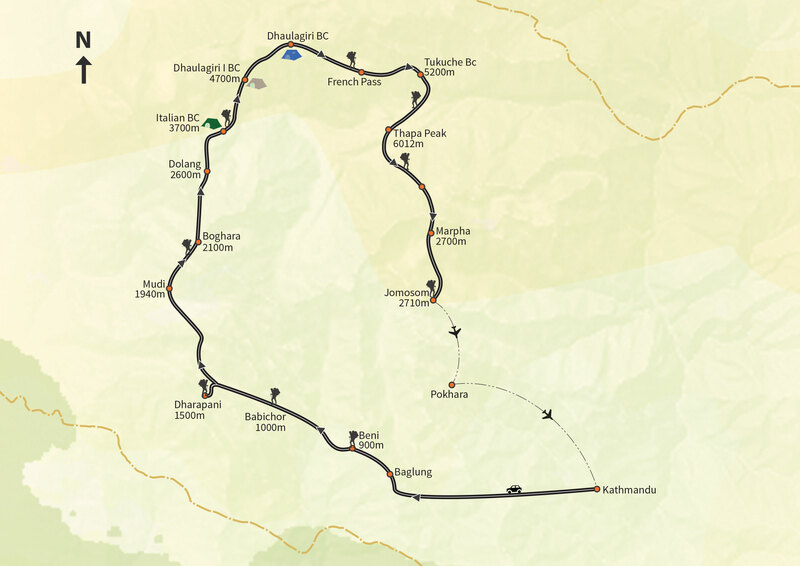 This 22-day trek starts from Beni where we first drive from Kathmandu for about 9 hours. The trek goes pass through different cultivated fields, villages and the forest where we will encounter from different ethnic groups along the way including Gurung, Chettris, and Magar to wild animals such as Himalayan Thar, Red Panda, Leopards and Musk Deer along with various species of birds. Meet the local ethnic groups in the region and encounter their traditional ways of living of Gurung, Magar, and Chettris. View of the 7th highest peak of world, Mt. Dhaulagiri (8167m) among many other enchanting Himalayas. Challenging high passes along the less traveled trails in the west of Dhaulagiri towards the trade route. Depending on the arrival time, Thamserku representative will be at the airport to receive you and transfer you to your booked hotel. Today, we will have a free day. Our guide can check our gears if we are not sure we have everything for the trek. We can rent or buy anything more we want today. An early morning starts by bus to Pokhara which takes about 8 hrs drive and then Baglung (1250m) with our Nepalese staffs (cook, kitchen boys, Sherpas, Sirdar). A quite 9h long way in total but the sceneries are great where we get to view big commercial villages, small typical villages, and terraced fields. Today we walk alongside the Kali Gandaki on a small path crossing villages. At the bottom of that valley, the scenery is very quiet; Dhaulagiri appears, but little far away. 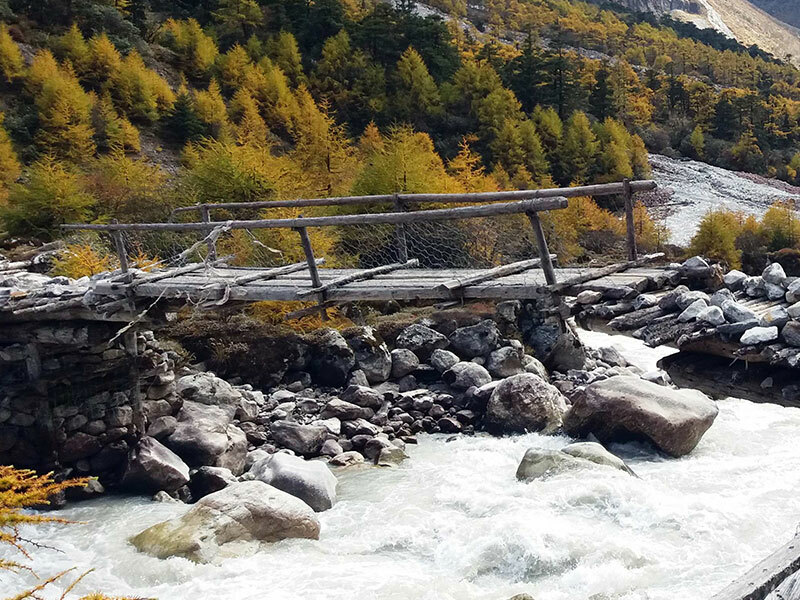 Leaving the Kali Gandaki valley, we go now alongside the Myagdi Khola crossing 3 suspension bridges along the way. At Tatopani, the sulfurous hot springs allow us the last bath before we return back to Pokhara. As we arrive in a very little busy trekking area, we notice the busy shops which are also the last as they start getting lesser along the way. We cross Darbang, a very nice village where we find a post office and some shops. At Phedi, the valley narrows for a long and steep climb on beautiful pine trees covered hilltop. We discover Dharapani and around full of villages scattered on the hillsides and surrounded by terrace fields. Here, house roofs are covered with pumpkins and millet is crushed in mortars. As we trek from Dharapani, the trail offers an excellent panorama of the surrounding mountains, Gurja Himal (7193m), Dhaulagiri III (7715m), V (7618m). From the path which crosses Takum and Mattim, small villages, we can view the yellow, ochre, green terrace fields. A good balcony path goes on till Mudi. Its settlement unity and concentration make it a very nice village. We might encounter children singing and dancing to collect money for the school. On a little-marked path through the crop fields, we go down in the narrow valley and reach Jugapani. Very nice and sudden 900m height difference climb above the river; a narrow and aerial path allows having a view of Dhaulagiri I along with Myagdi Khola that is sinking into a canyon with big waterfalls. At Boghara, the last village we cross, the settlement is scattered: despite austere surroundings and very hard life here, there are about 250 inhabitants living in autarky. We camp in the much frequented but really destitute school playground. We will enjoy the sunrise on Jokang today. The trekking path goes through a dense forest where we can see very typical and isolated huts of the last autochthones breeding buffaloes and big waterfalls. We will enjoy the sunrise on Dhaulagiri IV early morning. After a steep and sometimes slippery way down towards Konaban Khola, we will notice the first river after which we cross the Myagdi Khola on a small risky bridge. Humid and dense vegetation disappears for leaving the place to high pines. Way out of the forest is followed by a moraine crossing before entering again pines forest, after a steep climb to the foot of Manapati. We camp at west face foot, last vegetation line. The sunny spot is comfortable for acclimatization facing a beautiful mountain panorama. Today we will experience the Glacier crossing before entering a deep gorge, the old Chhonbardan glacier bed where we can easily walk although the trails is a very long and rocky route. We will have our eyes constantly looking at the Sita Chuchura (Blumlisalp at 6600m). The last moment seeing pass is facing Dhaulagiri north face. Rest day or walking around Base Camp. We quickly leave the glacier to reach a crest and continue towards the French Pass (5360m). From that pass, the way goes down towards the Hidden Valley where it is generally settled Tukuche Base Camp, a wide and open place amidst pleasant green places. Panorama of Sita Chu Chura (6611m) and Tukuche (6920m). Tukuche Base Camp - Thapa Peak (6012m) - Tukuche Basecamp. Today we can take on the optional climb on Thapa Peak. That day is devoted to Thapa Peak south face optional climbing (6012m). Members who are too tired can rest or enjoy walking around the base camp. We can use this day as a contingency day in case the weather is not good the other day. If the weather is good then this day can be used as a second climbing (there are many possible peaks around), or to a rest day for those who have climbed Thapa Peak on the previous day. Leaving Tukuche BC, we ascend towards the Thapa Pass or Dhampus Pass (5250m). Along hillside crossing till the 5092m point where we have a wonderful panorama over Annapurna range and Nilgiri massif. That crossing day may be delicate in case of bad weather, with possible use of crampons. A steep way down on a small path, with that little and pleasant feeling of a bird gliding! We reach Marpha, a very nice Tibetan village that is well known for its apple brandy. Through a wide valley, we go up alongside the Kali Gandaki river, before arriving at Jomsom, the main village of that valley with many shops. Here is the small airport allowing going to lower valleys. 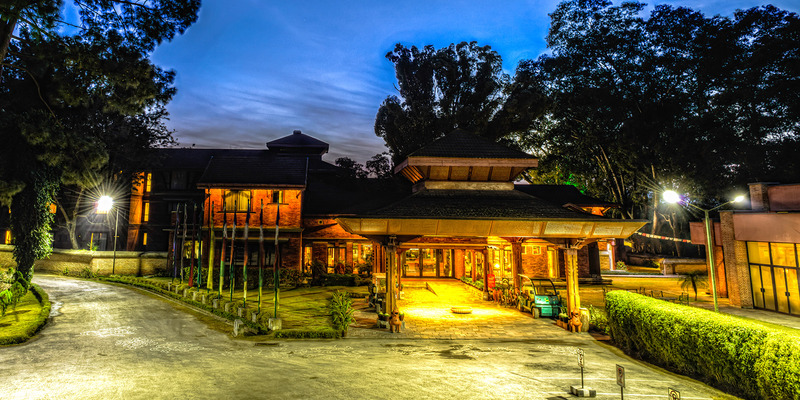 We take an early flight from Jomsom to Pokhara and then take a connecting flight to Kathmandu. On arrival in Kathmandu, we’ll transfer to hotel. We will have free time to relax or head into the city. 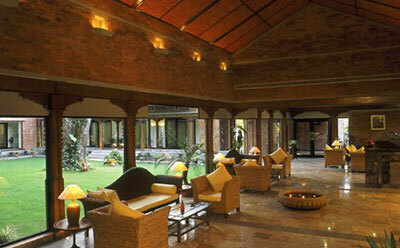 This tour spends four nights in a hotel in Kathmandu, and seventeen nights on the trek in tents on sharing basis. Day 15 : Tukuche Base Camp - Thapa Peak (6012m) - Tukuche Basecamp.